After seeing a number of troubling incursions into Taiwan’s media freedom over the last few years, the country is now faced with another decision point: whether NTD Television, an independent television broadcaster loathed by Beijing, is able to renew its satellite contract. As in previous cases, Taiwanese are seeking to pressure their government to ensure that they are granted the freedom of the press guaranteed by their country’s laws. Earlier this year Taiwan was saved from having over 50 percent of its media assets fall into the hands of Tsai Eng-Meng, a snack business billionaire with friendly ties to China’s communist regime. Tsai was part of a consortium of investors that was ready to snap up the media assets, including the popular and flamboyant Apple Daily, of Jimmy Lai, an anti-communist Hong Kong media impresario. Lai felt he was forced to sell after Taiwanese regulators made doing business on the small island sufficiently difficult, allegedly to please puppet masters across the strait. In 2009 Tsai had become a major player by buying up three Taiwan media companies that now form the basis of his pro-Beijing empire: China Times, China Television, and Chung T’ien Television. “We all act in accordance with directives, and report well and often about prosperity in the homeland,” Tsai is reported to have said in 2009, after the acquisition, in a meeting with officials in China. China Times is one of the three largest newspapers in China, while China TV is the biggest broadcaster; Chung T’ien Television is a large cable network. 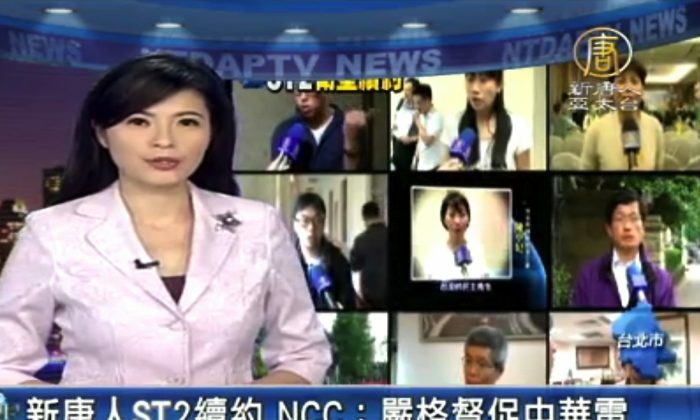 The controversy with NTD Television revolves around whether it is able to renew its contract with Chunghwa Telecom, the country’s largest telecommunications firm; Chunghwa is engaged in a joint venture on the mainland with China Central Television, the Communist Party’s broadcast mouthpiece, and has other business interests there. The Taiwanese government no longer has majority ownership of Chunghwa, but no one in Taiwan is under the illusion that President Ma Ying-jeou, and his regulators, wouldn’t be able to see the contract renewed (the current one expires in August) if they so desired. In an interview with Liberty Times, he said: “I’m afraid because the Chinese Communist Party is behind this, and they have a plan to what they’re doing.” When the Taiwanese media owners are given the conditions to make large amounts of money in China, “their media coverage changes noticeably,” he said. Along with the Tsai-owned China Times, the other major daily newspaper in Taiwan, United Daily News, is known to be pro-Beijing and pro-unification between China and Taiwan. Great hope is being placed on NTD because it is one of the few remaining independent voices, willing to report without fear or favor on corruption, political machinations, and human rights issues in China. As such, intellectuals in Taiwan have been particularly outspoken in support of NTD. The need to support NTD is all the more pressing given the treatment that the Chinese Communist Party gives to Taiwanese voices that it finds discordant. The former premier for the Democratic Progressive Party, Frank Hsieh, for example, had his Sina Weibo account deleted within 24 hours of registering it in February. The Sina Weibo microblogging service, a rough equivalent of Twitter, is enormously popular in China, and the harsh silencing of Hsieh drew concern both in China and Taiwan. Meanwhile, other forces in Taiwan are seeking to bring to Taiwan pro-Communist Party media, even as NTD is actively blocked by China’s regime. Feelings about such matters run deep in Taiwan. Ch’eng Jui-che, a graduate student in the Media Department at National Taiwan University, wrote in a comment to Liberty Times, a pro-independent newspaper: “We take it as a given in Taiwan that the Party and government aren’t involved in media—they in fact have the duty to expose the excesses of the state, and that’s the core value of a media institution. With research by Ariel Tian. The contract for independent satellite television station NTD, which broadcasts uncensored news from Taiwan into mainland China, is again at risk.